My family loves this simple but delicious gumbo recipe. We never have leftovers. 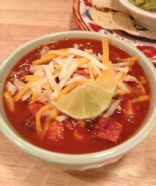 This tex mex chili is amazing served with a bit of shredded cheddar cheese and sour cream. Servings are a generous 2 cup size. This is for a double batch, you may half it if you wish. This is a thick hearty BOLD tasting stew. The ginger gives it a kick and the coconut milk adds a delicious texture and rich flavor. I was apprehensive at first as I wasn't too sure how this stew would turn out but it ended up being AMAZING, everybody loved it and had multiple servings, the pot was empty in no time !!! I promise this stew will not disappoint! A healthy way to enjoy an American favorite! This is a staple in our house during cold weather. I adapted this from a local resteraunt. This is great for when you have a cold and need some comfort! I'm sure it will get you feeling better in no time! Very satisfying and high in nutrients. A main dish soup. My family loves this recipe. This makes enough for leftovers and freezing individual servings. 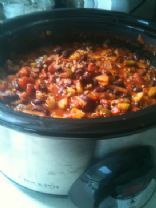 Great for those cold winters or when someone is sick - great healthy comfort food. A lighter version of a winter classic. This is my mom's recipe, doctored up a bit. Everyone who eats this wants to marry me. No Kiddin! BTW, nutritional info is without the toppings. This makes a hearty and filling soup! this is a delicious soup/chili and packs a punch! healthy and delicious! makes 8 1cup servings, very filling! Lofat and great on a cold day! This can also be made with turkey if you prefer.